Re: Why is there no seasonal cycle of phytoplankton biomass in the tropics? 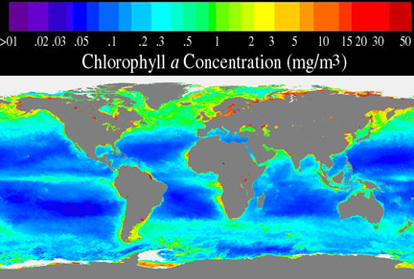 You've probably already seen it, but I put together a picture from the SeaWiFS satellite that shows a composite of chlorophyll concentration (a proxy for phytoplankton biomass) in all the oceans between September 1997 and August 1998. It shows quite nicely how much more phytoplankton biomass there is in temperate regions, on average. Phytoplankton biomass is regulated by a couple of important factors: the amount of light they collect, and the amount of nutrients available to them. If they do not have sufficient light or nutrients, they will not be able to grow, and biomass will not change much. In the tropics, there is not much in the way of seasonality, and it's generally pretty warm. That means that the surface waters can get pretty warm, and there's not a lot of wind to mix that warm water down very deep. Because the density of water depends on its temperature, the warming at the surface can cause the surface layer to become less dense than the water underneath it (which is cooler), and it begins to "float" on top of the cool water. Because these two layers are no longer of the same density, there is an interface between the two layers (the thermocline), which acts as a barrier to mixing, and to the movement of things like nutrients. So, the surface waters, once they become depleted of nutrients, can only be resupplied by whatever recycling of nutrients can happen in the surface layer, and by mixing of nutrient-rich deep water can happen across the thermocline (nutrients in deep water are also regenerated, but all you need to know is that deep water is generally high in nutrients). This doesn't amount to very much, and it results in phytoplankton growing slowly, and not a lot of growth overall; because the tropics are warm all the time this pattern persists over the entire year. Therefore, phytoplankton in the tropics are generally nutrient limited all the time. In temperate latitudes, there is stong seasonality. In winter, it gets good and cold, and there's lots of storms, which means lots of wind-driven mixing. So, in higher latitudes, the thermocline is seasonal, and does not occur in winter. This means that there is lots of mixing to very great depths (winter mixing in the Labrador and Norwegian seas reach depths greater than 2000m!). So, the deep, nutrient-rich water is mixed up to the surface. There isn't a lot of phytoplankton growth (or biomass) in the winter, because they become light limited, because they are mixed to such depths. In the spring, when it starts to warm up, a thermocline develops, again separating the phytoplankton from the deep water, but this time they are in the presence of abundant nutrients, and in the surface water where there's lots of light. When this happen, the phytoplankton begin to grow like crazy in a phenomenon called the spring bloom. Phytoplankton biomass can become extremely high during these spring blooms, which is why overall phytoplankton biomass is very high in temperate latitiudes. Of course, the phytoplankton generally use up all those nutrients eventually, and phytoplankton biomass is smaller in the summer once the phytoplankton become nutrient-limited. There is also often a smaller fall bloom as well, caused when winter mixing starts to break down the thermocline and nutrient-rich deep water beings to be mixed upward. As you're probably aware, the oceans are saline as well, and salinity effects density layers as well; however, as a first-order approximation, temperature describes the density patterns adequately. If you want to tinker around with your own spring bloom, check out the do-it- yourself bloom at the Plankt on Populations page.